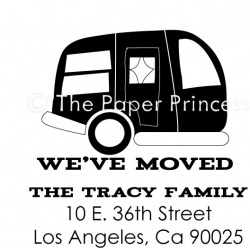 We've Moved Retro Camper: "The Tracy Family"
Add fun and flair to your snail mail with our custom return address stamp! Simply stamp onto an envelope, seal, and send! It's that easy! Other info: Stamp image measures 1.5" X 1.5". Image/text is deeply etched into our clear polymer to give you sharp, crisp images every time.